On the afternoon of Saturday last the Island Home was described coming down the bay toward Katama, bearing on her gangway an object which for some time kept a merry throng of expectant guests in a flutter of excitement and anticipation, and when finally the steamer had approached so near that the mysterious object could be fully made out, and word was passed that it was indeed the long-expected engine, then the enthusiasm knew no bounds, and with one accord the spectators adjourned to the wharf with the band to extend the welcome such an arrival deserved. The boat ran gracefully alongside the wharf, rails were laid down the plank, a rope and pulley tackle attached to the coupler forward of the engine, and amid the congratulations of the crowd, stirring music by the band, and firing of cannon crackers by the irrepressible Stumcke, the locomotive was run carefully down the plank and upon the wharf, safe at last on the welcoming bosom of fair Martha. A line of track was run the whole length of the wharf, and gradually the engine passed the Rubicon, so to speak, to the track above the Lodge, where steam was quickly made, the boilers filled and everything prepared for the first trip of a locomotive on Martha's Vineyard. Many of the directors were present, and these with invited friends, as many as the tender could accommodate, took their places for a triumphal ride to Oak Bluffs and return. Gaily decorated with flags, the engine started away at a brisk pace and rapidly made the distance toward Edgartown, producing a sensation all along the route. People stared from fences and backyards, lanes and pastures, as we swept by with waving flags and handkerchiefs, and small boys followed up the track at a run, in vain endeavoring to overtake us. A drove of cows pastured near the line of track gazed for one moment in horror at the monster approaching and then incontinently turned tail and fled in blind dismay across the field. A sober horse in a yard we passed an animal of strong wind but of feeble body, looking like a skin stuck full of bones and a candle burning inside a ghostly looking animal of this description, we repeat, stood leaning up against a fence to keep his feet, when, with a roar and a rush the engine passed him. That horse was a lost lunatic for the space of a minute! He woke up all over at once, and the way he worked away from that locomotive in successive summersaults was highly exciting to spectators. We noticed him as we came back, trying to climb a tree in the farthest corner of the field. Such was the absorbing attention we received all along. Approaching old Edgartown, we saw the vicinity of the station black with people, all looking down the track at us, and divided between curiosity and fear. We stopped at the station a few moments; long enough to receive congratulations, look over the machinery, and make the addition of one of your oldest inhabitants on top the tender, and then steamed away once more for the Bluffs, amid salutes of crackers and torpedoes from Stumcke, the unutterable, the unquenchable, who was gloriously happy on top the tender-box, and let off his fireworks with an ease and a looseness quite interesting to the nervous system of the oldest inhabitant. He had the best chance to see the display as most of the torpedoes went off under his seat, and his attention was attracted every time! We whizzed down the sandy beach over the long bridge and left a man and a horse struggling for the mastery as we passed, the horse evidently having the tremens or something; and going it for Edgartown regardless, all leg and eyes. The eyes stuck out clear ahead and got to Edgartown first by some lengths. Then we stopped to look over an ignited oil-box on a tenderwheel, and exchange signals with John Pease and his wagon-full of revelers, and others on the road near. Off once more at last, and faster and faster we fled for the Sea View, holding on for dear life in a perfect whirl of smoke and wind. We noticed several carriages along the road, every one of them empty, and five or six men holding the horses head round, away from the engine, and one man drove off the road entirely and was going across lots direct for Tisbury the last we saw of him. We rattled past the concrete drive, along the plank walk, greeted with cheers and wavings of delicate cambrics, by the bath arbor, crowded with spectators, for the news had spread that the engine was approaching and the crowd rushed to see it come in. And at last we drew up before the Sea View, the driving-wheels ceased to rotate, and amid cheering, music from four bands, salutes and greetings of the most cordial description from the crowd, we alighted, and the first trip of a locomotive over the MarthaÕs Vineyard R. R. had been successfully run. 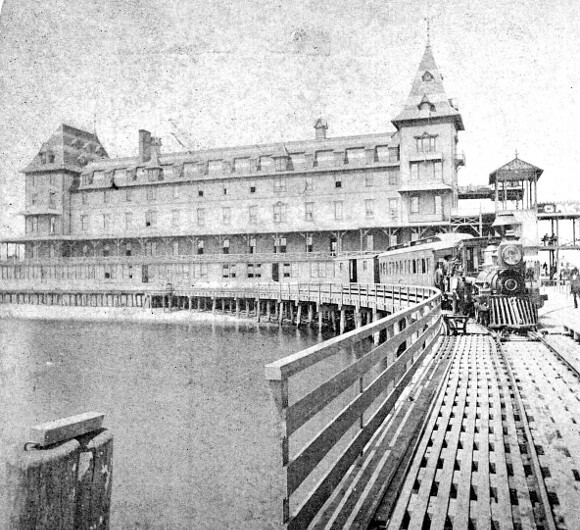 The broad piazzas and balconies of the Sea View were absolutely crowded with spectators, and the wharf was one confused mass of moving humanity, who surged round the engine and criticized and admired till the order was given to clear the tracks while the cars were backed down and a return train made up. We did not wait for more, our ambition was satisfied we had ridden on the trail trip, and trod on air, metaphorically speaking, the rest of the day. And thus opened a season for the road which promises to be one of immense satisfaction both to directors and the public, and a sensation and improvement to the Island for time evermore a golden age for the Vineyard which we earnestly hope will justify all the expectations. And it would not be just in us should we close without a word in reference to our obliging and attentive conductor, John B. Worth, who fills the difficult and responsible position assigned him, with a kind attention to his passengers which is rapidly winning him friends more and more along the route. His trains will always run on time, and everything done in his power for the road and its patrons.